It’s 2019, a year before a new decade begins. Are you ready for an amazing year? A year where your brand truly shines with promising growth, finds a new audience, creates more revenue and stands strong in its vision. ASK: What we can do with our brand this year that will be relevant, courageous and memorable? We all strive for greatness with our brands right out of the gate. That pure energy of showcasing the unique qualities that make our brand stand out and provide the reason why people need it in their lives. Somewhere along the way the energy, the voice, or the reason slowly fades and the momentum halts. Brands are not a single event or project that is wrapped up and done—rather they are organic and ever changing. Revisit your brand strategy regularly and make sure you are aligning to your original vision. As each new shift and opportunities comes along, evaluate how your strategy is keeping in step with these changes and look to see if your identity, message and offering are still relevant. Question whether your brand matters anymore as it may be time to evolve. ENGAGE: Get employees or perhaps customers involved to rally the growth. A great story, a great brand is easy to share. And the more people rooting and working for the same outcomes the more likely you are to extend your reach and attain your goal. Determine who your team is for each desired goal. Is it purpose, efficiency, sales, or simply spreading the passion? Set tasks and deadlines so everyone can work towards achieving results. Making the tasks small by breaking them out will provide smaller victories verses overwhelming your team with more work. It will keep morale positive and the productivity high to keep growing. START NOW: A small step at a time makes 2020 a reality. There is no better time to start then now. A year from now you will be happy you made these insights, had some incubation time and reflected on where you’ve been, where you are and where you want to be. When things get busy, we hit the ground running and forget to stop and look around to see where we are and who's doing what. It’s crucial for your brand’s strategy and identity to make sure you are taking notice, taking steps to ensure its relevancy. A new decade is less than twelve months away. Make this year count so you can be confident of where you stand this time next year. Describe your customer. Who are they? Who do they want to be? What are the barriers between these two states that your brand or company helps remove? The answers to these questions can help you identify exactly how you want people to feel when they enter your space, and exactly what you want them to do once they are there. We’ve said goodbye to 2015 and welcomed in the New Year. Prior to the clock striking midnight you might have reflected on the year’s changes, memories, new friends and outcomes that occurred. Many of which we could have never predicted. Life throws us curve balls and its more important how you deal with them and move past them than why they happened in the first place. Think of how you handled difficult situations this year. How you’ve grown from years before. Stop to pat yourself on the back for being at this stage in your life, even if you aren’t fully satisfied. If you feel you are on the right path give yourself some credit for finding it. If you feel lost and off course, make this New Year the time to explore the path that’s right for you then give yourself credit for realizing a new direction is needed. We can easily get bogged down by our jobs, stress, family, and bills or become drained by the routine. But going through the motions everyday can leave you perplexed by how the years went by or depressed that you haven’t accomplished what you wanted. You don’t get what you don’t ask for. So if we aren’t honest with ourselves about what we want out of life we could miss the opportunities when they come. Visualizing our goals, dreams and desires is important to realizing self worth. A great way to do this is by creating a visual board. It’s simple, fun and impactful. Begin by searching for images online, or in magazines that visually represent what you want to achieve this next year. Tape, or glue them on a board or create your collage in a computer program and print it out. Hang up your collage somewhere you will see it everyday like your fridge or bedroom wall. The key is to make sure you glance at it everyday. When something is top of mind we are more likely to see opportunities and take them. This time next year you will be surprised by what came true. Don’t let your days fly by, start today by asking what you really want this next year to look like. Everyday is an opportunity to reach towards the kind of life we desire and the type of person we wish to become. You often hear the adage, “the details make the difference,” or “mind the details,” but how often do we truly see businesses and brands bringing real nuances to life into an unforgettable experience? According to magazines like Fast Company, Wired and Inc., not as often as we should. Yes, a solid business plan or offering is essential for success as is an intelligent strategy on how to turn ideas into action.But then what? The last 20 years have seen companies and leaders stressing don't get it perfect, just get it to market. Then you can tweak it. In the rush, however, we may be losing the sweet and serious ingredients that make great brands and businesses not only be seen and heard, but understood. Brands that execute exceptional details matter to their audience. They are felt. They are experienced. And they are ultimately shared with others. Why do details matter? For starters, they are the first thing your audience will remember and share with others. These details set you apart from your competitors as well as other repetitive and mundane occurrences in your audience's lives. The details connect with your audience assuring them they belong to the tribe and that you are speaking to them. You then become relevant. The details make their day better, make their business easier. The details delight. When looking for a company that has exemplified both sides of the coin, speed to market and the details, a famous computer company from California might ring a bell. Apple soared at getting fresh ideas to market knowing that they would have to adjust but also designing in thoughtful and elegant details including product, ergonomics, packaging, narrative, user interface and marketing. The two principles were never exclusive of one another. The result is history but the impact of their product, service and brand is undeniable. So as you sprint to the finish line, how will you balance time vs. designing in the thoughtful details? Which details will make it and which ones won't? Which ones can be added later? Which ones will serve your audience well and delight? What ever the answer, don't just forget them. You may only have one shot to get it right, so make it count. Is your Brand’s face a turn off? Has this ever happened to you? You walk into a business and the person behind the counter doesn’t look up. What seems like minutes go by and you have to make a sound or say “excuse me” to get their reluctant eyes to meet yours for a blank stare and awkward pause. How does this make you feel? Like you’re unwanted or imposing? It’s faces like these that turn customers away to other businesses with open arms. Your brand is reflected through every element that comes in contact with your audience—they experience everything. Unless you want your brand to communicate being rude or dismissive make sure the faces that are representing your brand are doing it justice. These faces are your brand’s reputation. It starts at the door, it starts at hello, it starts with a smile. If you don’t have a brick and mortar store or physical presence your face is online. That first experience with your customer is just as important. At its base the experience should be friendly, professional, and communicative. So think through the customer experience online in much the same way you would in person. If you choose to advertise on your site make sure it doesn’t take over your brand’s message. For instance, don’t welcome your customers with an advertisement for another brand. This not only discredits your brand but also confuses and frustrates your customer. First impressions are everything. They’re like a first date. If you showed up disheveled and drunk your date would probably end the night early. If you chose to have someone else show up for you, your date might leave before you get there or they might have dinner with that other person instead. A brand is no different. If you want your customers to pick you, be kind, honest and engaging. In other words put on your best face! Have the 5 Core Essentials? Too often, companies try to be all things to all people. Narrow in on what makes you tick and what you are best at. You will be better at what you do; it will make you happier, and your customers will notice in a heartbeat. Enough can't be said about finding your compass in why you're doing and what you're offering. Having a strong purpose will steer you honestly and make every decision in business not only easier, but more joyful. You can't deliver on what's not authentically you or your team's. Action > Be the real you but stretch you. Have a conversation with yourself rather than others and discover your soul. List everything that gets you out of bed and puts spring in your step. Examine if you can truly deliver because the world quickly sees through posers. The world is full of “me too” products/services that are just cluttering the market place and adding noise to our already busy lives. Why not offer up a dose of originality and see how much easier life is when you don't have to spend all of your time explaining how you are different. Action > Turn your world upside down. What can you do or solve that others aren't? Forget the status quo and the Jones, they're broke, uninspired and unhappy. Evaluate what's too comfortable, if something is, it's probably not very different. The days of keeping things close to your chest and hush hush are gone. Today's world is connected, transparent and empowering. And thank goodness. A life of sharing and awareness makes everything better for everyone. Tell all what you are doing and why! Action > Find every possible way to tell your story. Think of and share every detail, they really do matter. Don't be loud, be clear. Let others know what they really need to hear. In order for things to elevate, to refine, to grow, we must constantly evolve. The pulse of your brand has to be in a constant rhythm of observation, evaluation and enhancement. The world will let you know soon enough so make sure you are ready to deliver. Action > Listen hard to every aspect of your brand. Try lots of things and don't over think them. Make it easy for customers to give you insight and feedback. Reward those who serve you. LIKE WHAT YOU HEAR? LET'S TALK. Astronauts & Poets is a brand and design agency that creates immersive brand experiences that matter— connecting our clients to their audiences. We have a thirst for storytelling and would enjoy the opportunity to meet and discuss how we can help you turn heads and move hearts. If you'd like a pdf version of these Brand Essentials we'd be happy to email it to you. As we close out the year, we want to say thank you for the opportunities, partnerships and comradery. We look forward to a prosperous New Year and we hope to see and talk to you soon. Cheers and may the holiday break be a fruitful one. Please let us know if you have any design and branding needs whatever the size, we're eager to help you succeed! You’re proud of the products or services you offer and you have a strong clientele. Now what? You can ride this out for a while but like any relationship your customers will eventually desire ‘more’. Why wait for them to have one foot out the door before you fulfill that need. If you can’t find a problem, create one, then solve it. What could enhance your customer’s experience? Don’t limit your thoughts around what you can offer. Focus on customer touch-points and cycle. What could extend your connection and relationship with your customers? If you come up with a solution that is beyond your expertise consider partnering with someone who is an expert in that area. Partnerships can provide quick solutions, great relationships and expanded experiences for you and your customers. Sure, you could spend time and money trying to be everything to everyone but why sacrifice what you really are good at and known for. Partnerships can make you cool. Partnering with another company can be a great opportunity. Great press, renewed attention, and access to your partner’s connections and trusted clientele. Southwest’s image has been on the rise for the past several years with their superior customer service campaigns. They used to be known as the cheap airline but now they’re more known for free bag checks, smiles and snacks. Southwest has become the affordable airline with extended experience. They saw an opportunity to take that further based on the number of customers wearing headphones while riding through the sky. Beats Music extends that desirable experience for their customers and creds Southwest Airlines cool for doing so. Of course, it goes without saying it’s all about finding the right partner that you can both benefit from and work well together. You want someone that will scratch your back if you scratch theirs, so to speak. At Astronauts & Poets (http://www.astronautsandpoets.com) our partnerships have been ideal extending our services for our clients as well as our partner’s clients. And beyond the business value, the relationships have been fun and enjoyable. It’s a good feeling having experts on your side. They make you better – you make them better. New experiences, partnerships, and thinking beyond yourself can lead to extended relationships that are beneficial to you and your clients. The ambitious sci-fi film directed by William Eubanks is a journey more than worthy of your local theater outing. This uniquely stylish film has a quite aggressive concept in mind as the script unfolds and when it collides with breathtaking imagery, the result is fresh, modern and yet familiar. There is a sense of humor, a touch of restraint and ultimately, a smart film that keeps you guessing and engaged for all 95 minutes. Beyond the accomplished acting by mostly unknowns, save Laurence Fishburne, the film also presents a unique and original approach to the otherwise cliched attempt at extraterrestrial visitors. We like this film not just because of these notable attributes but also because of the poetic story of how heart greets technology and delivers a story worth emulating. A story of will and determination. Our very own principal and creative director, Greg Morgan, will be the AIGA, Into the Woods Director and has taken a board position with The Seattle chapter of AIGA. Into the Woods is an inspiring three-day hands-on expedition conference into the creative core of professional design. Journeying into the woods and out of the office, designers, guest speakers and industry vendors will assembly in the back country as they put down the mouse and bring out their heads and hands to experiment, explore and master creative thinking and skills. The event is done every other year by the local AIGA chapter and infuses 300+ creative types with all sorts of inspiration including: silk screening, letterpress, painting, hiking, sculpture, drawing, experimental art, as well as industry gurus sharing their stories and passions. Greg is very excited to deploy the Astronauts & Poets team as they help the chapter build and lead the Into the Woods committee for the 2014 outing. What is so powerful about sleeve design in packaging? Well, even though we almost kissed the decadent size of the 12 inch vinyl album goodbye, pretty much ignored the undersized cassette package, and now are in the process of saying au revoir to the CD sleeve, there is much to be learned from this amazing medium. Actually, in the fury of digital downloads, the 12 inch sleeve lives on thanks to independent artists and consumers with enough gumption and passion to keep them on the shelves. Yes there are digital booklets for download, but how many of those have you actually downloaded? The mystique, emotion and power of the sleeve is wise to study. It is on these gems you will find design solutions and story telling that convey one of the most emotive mediums, music. This highly sensory medium is a challenge to capture correctly and when paired with the character and brand of the artist and/or label, only skilled designers get it right. Music represents the time that you live, the culture of the street, the pulse of the city, the word of the youth and the technology of the process in making the music. Music can be articulated as being one of the most compelling portals to our souls. There have been some amazing designers who have created their careers and owned categories for this work including Malcolm Garrett of Assorted Images, Vaughn Oliver, Nigel Grierson and Chris Biggs of 23 Envelope/v23, Mark Farrow of Farrow Design, Neville Brody of Research or the sleeve king himself, Peter Saville of Saville & Associates. Saville’s trek with co-founding Factory Records and creating nearly all of their identity and sleeves, today easily fills up lecture halls and books annually. These legends have all inspired countless designers to create amazing music packaging and sleeves today. But why? For starters, sleeves have to be provocative. They have to woo you in and get you closer. If you didn’t pick it up, you surely weren’t going to buy it. The sleeve presented a unique situation where a large amount of brand or story had to be told in a quick snapshot measuring 12 x 12”. Imagine fitting a story, a mood, the band’s character, the label’s character, the sound, the lyrics, the emotion and the quality all in one design. The solution was all of these, one of these or even none of these if by design. Either way, the sleeve had to seduce you, represent emotive qualities and perform on a ledger to make profits. The sleeve then began an experience by how it unfolded the story from outside to the inside, to the liner notes and inner sleeve. To the vinyl label, color and shape of the vinyl and with any inserts like posters or photos that were slipped in. These sleeves came wrapped, gate folded, packaged in boxes and other eccentric containers. They came in 7, 10 and 12 inch variations. Electronic and dance music even saw multiple versions and mixes released providing a myriad of sleeves from the same album of songs allowing the designer to paint a very comprehensive glimpse into the artist’s brand. So dust off the turn table, throw down a mix, and as the cracks and pops delight, use the enigmatic nature of the sleeve design to provoke something different in your next package or design solution. The word Experience or Experience Design has become a recent buzz word over the last several years. Just when the category of Branding has grown up and become much more diverse, dynamic and expansive, businesses are now being bombarded with the notion that they need to create live events and interactive experiences. But why? Isn't your logo and product/service offering, consistency and clear language enough? Not only no, but absolutely no. Experiences are defined as any extended activity that truly engages and emerges your audience in your brand story. It connects them to you—personally. Experiences can be live events, shows, conferences, exhibits, private parties, installation, online activities and more. These experiences take your brand, story and identity and brings them to life much more dynamically. In experiences, people are face to face, products are touched, services can be seen in action and your audiences emotively connect to you, your team and your brand unlike other mediums. Experiences become highly memorable and personal. They impactfully deliver your brand promise. When you are live, you also reap the benefit of feedback, dialogue and networking that leads to other opportunities for your company growth. So before you craft your next newsletter, brochure or e-blast, think experience instead. How can you get your audience together while delivering them unbelievable content in a way they won't forget? No one will have to wonder where the refreshments are at Hannes Broecker's art exhibit — drinks are the main attraction. Reminiscent of something chocolateer Willy Wonka might dream up, the display is made up of nine panels of colorful beverages and a palette topped with countless glasses. 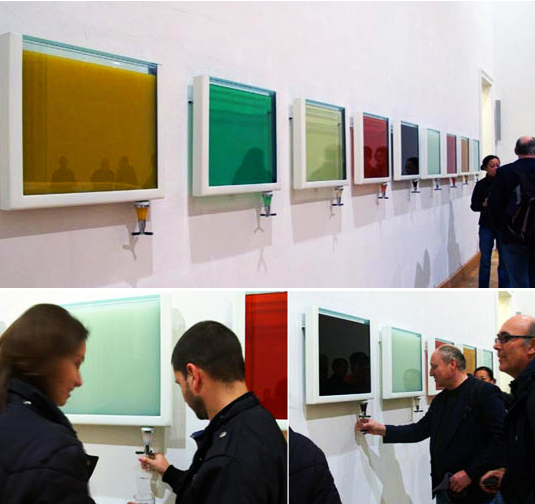 Visitors simply grab a glass, go to whatever color draws them most, and pour themselves a drink.